Pearson Prentice Hall, 9780132498289, 296pp.
" The best-performing companies have leaders who actively apply moral values to achieve enduring personal and organizational success." Lennick and Kiel extensively identify the moral components at the heart of the recent financial crisis, and illuminate the monetary and human costs of failed moral leadership in global finance, business and government. The authors begin by systematically defining the principles of moral intelligence and the behavioral competencies associated with them. Next, they demonstrate why sustainable optimal performance on both an individual and organizational level requires the development and application of superior moral and emotional competencies. Using many new examples and real case studies and new interviews with key business leaders, they identify connections between moral intelligence and higher levels of trust, engagement, retention, and innovation. 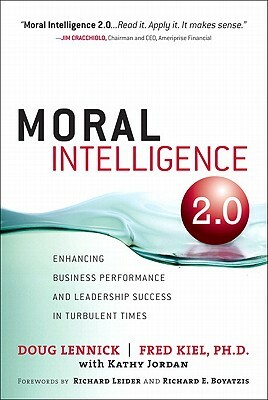 Readers will find specific guidance on moral leadership in both large organizations and entrepreneurial ventures, as well as a new, practical, step-by-step plan for measuring and strengthening every component of moral intelligence from integrity and responsibility to compassion and forgiveness. The authors also provide practical ways for readers to develop their own moral and emotional competencies. "Doug Lennick" Doug s career as an executive, a sales manager, and a developer of people is legendary. Today, in addition to his work as CEO and founding member of the Lennick Aberman Group, Doug continues to work directly with Jim Cracchiolo, CEO of Ameriprise Financial, formerly American Express Financial Advisors. Although no longer full time, Doug retains the title of EVP at Ameriprise Financial. As a senior advisor to Jim, Doug s focus is on workforce culture and performance. As a leader, a coach, and a mentor, Doug has taught thousands how to be successful in both their personal and professional lives. Doug is a graduate of the University of Minnesota, Morris, with a degree in business management. In the early 1990s, Doug was one of two (the other being Jim Mitchell) senior managers at American Express responsible for championing, developing, and implementing the Emotional Competence training program that was recognized by the Consortium for Research on Emotional Intelligence in Organizations as a model program. Doug s work and American Express s Emotional Competence program were recognized in Daniel Goleman s "Working with Emotional Intelligence "and in "Educating People to Be Emotionally Intelligent," edited by Rueven Bar-On, J.G. Maree, and Maurice Jesse Elias, and in Tony Schwartz "Fortune "magazine article on the same topic. In "The Power of Purpose, "Richard Leider referred to Doug as the spiritual leader of the company. Doug lives in Edina, Minnesota, with his wife, Beth Ann. Their youngest daughter, Joan, attends graduate school at St. Mary s University in Minneapolis and has an undergraduate degree from Stonehill College in Easton, Massachusetts. Their oldest daughter, Mary, has an undergraduate degree from the University of Minnesota and is a graduate student at Augsburg College in Minneapolis. Doug s son Alan is an actor and a manager/financial advisor for Ameriprise Financial and is living in Minneapolis with his teacher/actor wife Sari, and their son, Dylan. "Fred Kiel, Ph.D." One of the pioneers in the field of executive coaching, Fred began challenging senior executives in the mid-1970s to improve their leadership skills. Trained as a Ph.D. counseling psychologist, he left the private practice world in the mid-1980s and has since devoted his full-time career as an advisor to CEOs and senior leaders in large organizations. In the late 1980s he co-founded KRW International, one of the durable and highly respected boutique firms in this space. He is also the founder and executive director of the KRW Research Institute, which is conducting research on the hidden beliefs and biases CEOs hold in their heads and hearts. These findings will be reported in a book scheduled for publication in 2012 and currently titled, "What CEOs Believe and How It Impacts the Bottom Line." Fred lives on his organic farm in Southeastern Minnesota, in the midst of cold running trout streams and Amish farms, along with his wife, Sandy. Sandy is the innkeeper for the Inn at Sacred Clay Farm their country inn bed and breakfast with five luxury guest rooms and meeting space for small groups. "Kathy Jordan, Ph.D." Kathy was the collaborating writer with Doug Lennick and Fred Kiel for the first hardback and paperback editions of "Moral Intelligence," and with Doug Lennick for his book "Financial Intelligence: How to Make Smart Values-Based Decisions with your Money and Your Life." She is also co-author of "Becoming a Life Change Artist: 7 Creative Skills to Reinvent Yourself at Any Stage of Life." Kathy has a Ph.D. in counseling and human systems from Florida State University. After working for large organizations (AT&T Bell Laboratories and later Harvard Business School Publishing Corporation), she has flourished as an independent coach, consultant, and writer. Kathy lives in Saint Augustine, Florida, and Colorado Springs, Colorado, where she enjoys family time with her daughter Erin, son-in-law Doug, and granddaughter, Mackenzie Kathleen. "